Singapore Airlines (SIA) stories of stewardesses, stewards of more than 10 years by Boh Tong : Will cabin crew be happy to have TPT back again? Will cabin crew be happy to have TPT back again? All systems back to normal... ha! ha! warning letters, beautiful.. life is simply beautiful. Looks like it is a demotion for TPT and a promotion for MT. A dog returning to its vomit. Certainly looks like a promotion for MT which was expected. TPT is not very much liked in CC. He must be the one and only HOD to be returned to his former office that has been a springboard for directors aspiring for the upper echelon. 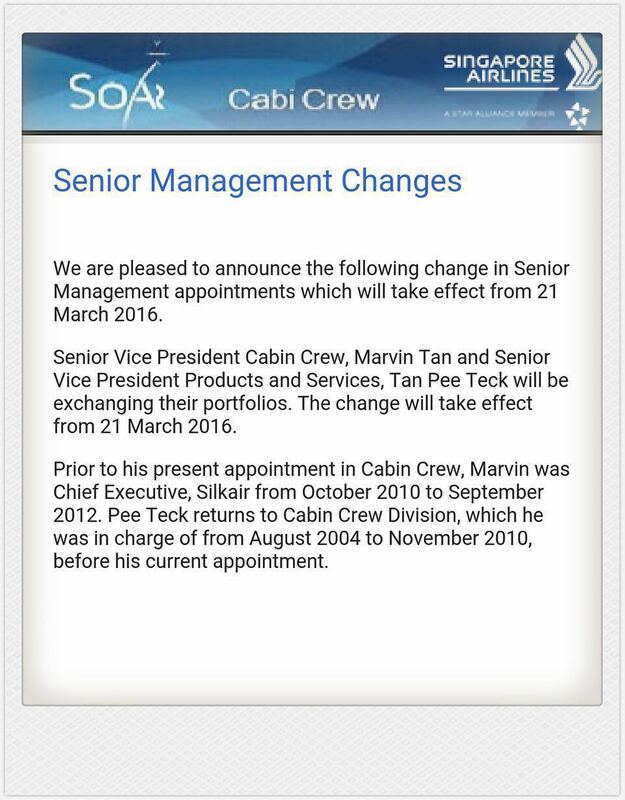 Marvin Tan had done a good job at SilkAir and his elevation to higher office is recognition of his good performance at Cabin Crew. All of us would like to see SQ retake its position that it enjoyed before. Does it matter who is back? If the crew culture doesn't improve its all hogwash. We all know senority talks in cc. Senior eat first junior wait. The grapevine was abuzz with news when TPT played a major role in arranging a B747 reconfigured for Mrs. Lee when she fell ill in London some years ago. Seems that the PCL cabin was equipped with life supporting accessories. She came back safe and sound. This was a big relief for her considering the fact that she had to wait for her turn. He could have been promoted on that initiative, amongst other things. I presumed you must be junior. Cos u want the same priviledges and respect fue to seniors accorded to you. Ask yourself, when you are senior, you like your juniors eat first and wlyou wait? You like to greet juniors instead of juniors greeting you. communist leaders are treated "differently" because they are respected and adored by peasants! try removing that tiny rank and see how many juniors respect you. Move with the times la.. computer must update, so must our otak. What were the "egos" of those selected to be crew? Humble? team spirited? compliant? cheerful? When did these attributes begin to fade? How did "egos" become such a big ballon?